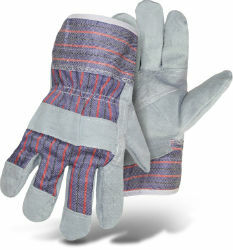 Economy split leather palm gloves with breathable cotton back for ventilation. Pasted safety cuff provides added protection to the wrist area in addition to ease of movement. Shirred elastic wrist for a secure fit. Wing thumb for mobility and long wear.